Randolph physics students recently won Children’s Assistive Technology Service‘s (CATS) Hallowheels costume contest and fundraiser—and also made it a very special Halloween for a disabled six-year-old named Maddie. Randolph’s Society of Physics Students created a Cinderella-themed costume around Maddie’s wheelchair they called “Maddierella.” In the voting, Randolph helped raise nearly $1,000 for CATS, which will be used to purchase adaptive devices and mobility equipment for children, at no cost to their families. Based in Roanoke, CATS is a volunteer-run nonprofit serves as a no-cost resource to children with disabilities who need adaptive equipment and whose families have limited resources. 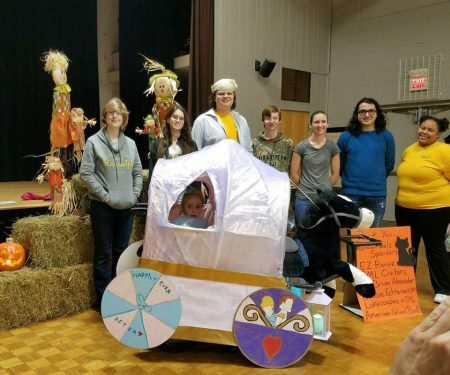 Six teams competed to make a Halloween costume using wheeled mobility. The idea, according to organizers, was to make the wheelchairs an asset rather than a liability.